The Web is an odd industry to work for when you take the time to think about it. I can’t think of many professions where a person’s job becomes such a large part of their lifestyle. The 9-to-5 job is commonplace for the majority of the working population, with few taking their work home with them. Can you imagine a tax accountant doing her work at home simply for fun? Yet, for us — web designers, web developers, UI/UX designers and the like — it’s not uncommon to get home and immediately jump into the computer or undertake something else Web-related, even when we’re off the clock. These activities could be as time-consuming as freelance project work, volunteer work, contributing to our favorite open source project, participating and contributing in community forums such as Stack Overflow or as simple as reading the latest news on Twitter and catching up with our RSS feeds to keep up with the industry. Working within the Web is most certainly a lifestyle choice, and all this time spent immersed in our working environment can affect our passion and motivation for it. But, at the same time, it’s also our passion and motivation that drives us to spend so much time in our medium, and something that I think is vital to our success within the industry. It’s like a feedback cycle. However, so much time surrounded by our work can be difficult and straining. Too much of anything isn’t good. As well, to keep motivated and passionate all the time is impossible. At times, external influences (family, friends, relationships) and our own personality traits can lead to a point where we simply wish we could do anything but work on (or even look at) a website. This isn’t something we have any control of, nor should we shy away from the fact that we can simply lose interest in what we’re doing. That’s life. What we can do instead is try and recognize the reasons why we’ve lost that interest and learn how best to reignite our passion, not only to ensure that our work and income does not suffer, but also to help our own state of mind. I’ll share with you a few things that might help maintain and reignite your passion for your craft. At times, it can feel like your next project is no different from the last. It’s just the same code with a new lick of paint. Rather than let this be the case, why not inject something new into your next website build? By adding something new to your repertoire that you’ve never tried before, you place something challenging within the project that differentiates it from the previous sites you’ve created. The challenge will not only continue to pique your interest in the website project but also give you practical experience that you can use in other endeavors. It’s an annoyance of mine, but I’m easily bored and distracted. So when it comes to working on a large website project, it can be difficult to get through the whole thing without wishing it was finished already. But as a generalist myself, I have the handy ability to swap job roles to find something new and interesting when the mood takes me. Changing focus onto something else — hopefully something more interesting — will not only improve your state of mind but also ensure a project does not suffer from being rushed as you try to get it finished as quickly as possible. Simply look for something that can engross your interest, and return to the “uninteresting” stuff when you’re in a better frame of mind to tackle it. Conferences are an excellent environment in which to “top-up” your passion for the craft. I can almost guarantee you that at least one speaker will present something new to you or give you a new perspective on something that will have you wanting to adopt the same in your own work process. In fact, you’ll feel like you can’t get back to work fast enough to try out the new things you’ve learned. Honest! But conferences aren’t all about learning. There’s the networking, the socialization element and the enjoyment of being able to speak to (and perhaps grab drinks with) other Web geeks. This can further motivate you in your work, and make you remember why what you’re doing is awesome. Just because attending a conference/workshop/event feels like it’s work (especially if your employer is footing the bill to get you to there) don’t forget to take the time to have fun, recharge and relax. Doing so will make it feel like you’re returning to work after a holiday. Conferences are expensive, especially when you have to go out of pocket. Sure, there are some that are cheaper than others, but then you have to consider the travel and hotel costs. Not all of us work for companies willing to pay for conference-related expenses, so we might not be able to afford to go to them any time we wish. Instead of paying an arm and a leg to attend a conference, you could consider spending an evening with like-minded people at one of the numerous meet-ups that are held around the world. Much like a conference, there may be speakers to inspire you, other geeks to chat with and most likely something alcoholic to make things go all that more smoothly. 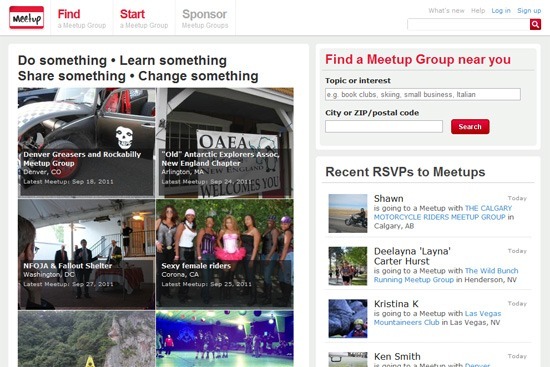 Use Meetup to find meet-ups near you. Browse Lanyrd, a social conference directory. If you work full time for a web design agency, you will probably have little influence on the type of projects you undertake whilst you’re at the office. This can get a little frustrating if these projects don’t give you the opportunity to expand your expertise, cultivate your passion for the work or if they make you feel unmotivated because of the repetitiveness of the tasks. If this gets you down, try to look for a personal project to work on in your own time that you can really feel passionate about. Learn how to create an iPad app. Learn Rails and then create a subscription-based web app (read this story for inspiration). Build an app for mobile devices. Do volunteer work for non-profits and struggling public education institutions. Develop a jQuery plugin, learn how to use a version control system and put it up on GitHub. Contribute tutorials and articles on design-related sites. Read “Reminding Yourself That You Love What You Do” for ideas and inspiration. I’m sure every web professional has their own horror stories about clients; it’s simply something that’s unavoidable, even for the largest of agencies. So sometimes, it’s a pleasant relief to be able to take the client out of the picture and create something without the constraints associated with client work, such as their needs, cost and schedules. An internal project, for some, can be a success and evolve to become their sole company job responsibility. For others, it’s for a little bit of fun and a chance to do something out of the box. No matter what happens at the end of the process, it’s the journey that matters. So long as an internal project doesn’t become a source of stress, it will most certainly be a process you will enjoy and be passionate about. Becoming better and widening our knowledge is, I feel, a critical requirement of the job. You cannot simply enter a job as a web designer and expect to sail through your career with the same knowledge that you had at the start. 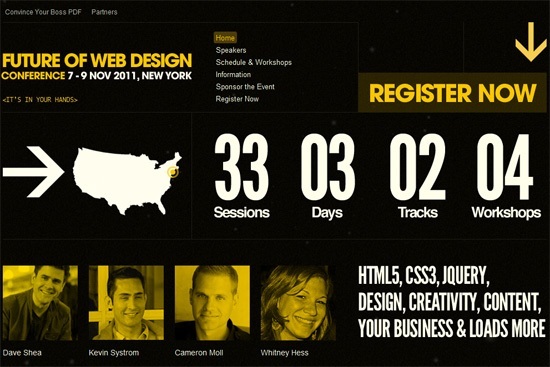 Web design evolves at a lighting-fast pace, and it would be detrimental to your success not to keep up. The process of learning about web design not only gives you something to do if your daily tasks are a little dull, but it also gives you something to potentially use in your projects. You may currently be working in somewhat of a generalist role, but within this, you’re probably also undertaking tasks that you might not be all that passionate about. You may be a web designer that also codes — which, of course, is a great thing — but you might be coding more than designing and would rather move into a more specialist role as just a designer working within a graphics application like Photoshop. By specializing (even just on a temporary basis) you can remove some of the tasks you are less interested in and thus spend more time doing the work that you are really passionate about. Specialists are great. Specialists can know the most detailed things about their role — what they may lack in breadth, they more than make up for in depth. But sometimes this can feel limiting. A specialist may not know much about the whole website production process because they may be too honed in on their own job role and segment of the site build. If being a specialist feels constricting and you want to learn about some of the areas that you have less experience in, then move to become a web generalist and find that passion in all the areas you’ve yet to explore. Both specialists and generalist are important to the industry. Choosing which you are is a personal choice and will ensure you enjoy your job more. Web designers have to be the most wired-in people in the world because we’re exposed to the Internet more than most professions. Thus, our work is constantly within an arm’s reach. And, for many of us, disconnecting is difficult and seemingly impossible, even when on a holiday. But taking a holiday and disconnecting for even a short time can re-energize you so that you are better able to tackle the stresses of your daily life when you return. It is also an effective preventative measure against design burnout. If you start to feel low while at work, try to find a late deal on a holiday. Taking a break and coming back refreshed and motivated can increase productivity. Sometimes being the master of your own domain can help. Cutting out the possibly endless hierarchy within a company and having greater control over a project can be enough to satisfy a person’s personal desires. When freelancing part time, it gives you greater control without so much of the administrative burdens linked with freelancing full time. It also allows you the benefit of being able to be choosier with the projects you undertake. As a supplement to a stable salary, you can take the projects that interest you most. 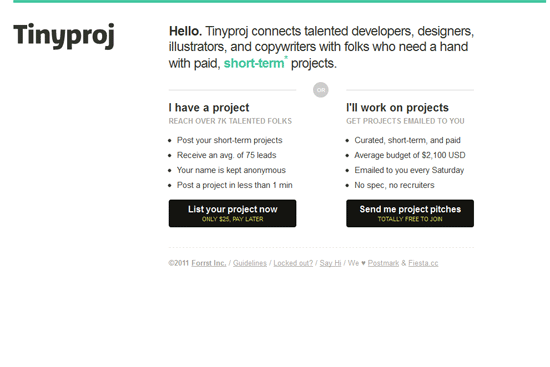 Tinyproj is a site that connects designers, developers and other creatives with paid, small projects. WeekendHacker is a design/development network for getting help on (very) small projects. Coffee & Power is a marketplace for buying and selling small jobs. TaskRabbit is a marketplace for community projects. Check out the freelance jobs at the FreelanceSwitch blog. See Smashing Magazine’s Freelance Job listings. Use social networks for finding work. Check out these great resources on freelancing. Do you know of unconventional places to find web work? Subscribe to RSS feeds for design and development job seekers. There are times where a few hours of freelancing aren’t enough to get you out of feeling as if your time at your current workplace is coming to an end. There can be a multitude of reasons for wishing to leave a company — from poor management through to a lack of influence in being able to work on jobs that excite you. If staying with a company is no longer challenging or negatively affecting your passion for your craft, then finding another company to provide you what you seek is the best next step. In this current economic climate, this is a very risky proposition. It’s certainly a big step and a decision not to be taken lightly. However, in some situations, it may be the only choice. Another option is to start your own company. Read the stories of entrepreneurs who’ve chosen to go their own way despite the tumultuous economy. Changing the company you work for may indeed provide that new challenge that refocuses the mind and brings about a renewed passion for the job you do. But if it’s the trappings of company life that are affecting you, then going freelance may be the next logical step. This one’s even bigger than simply changing workplaces and should never be undertaken from a standing start. Going full-on freelance works best as a progression from having done freelancing part-time. You need that knowledge, experience and clients to help ease you in. Some savings will help, as it can be very hard to come across scratch when first starting out. But once you’re there, you will have full control of your fate. Your passion is your own to influence. Anything that affects that is certainly yours to change. Is Web Design For You? If getting out of bed and going to work is becoming an ever-increasing challenge, then hopefully, one of the above suggestions will help reignite your passion in your craft. But if none of them seem like they’re for you, then you should look within yourself and ask if being a web designer is what you really want to do. Like all jobs, there are those of us who are a perfect fit for this profession and lifestyle, and others who aren’t. It’s always been my opinion that if we have to spend so much of our life at work, then we have to do something we love, something we’re passionate about and in an environment we feel comfortable in. Life is simply too short to be stuck somewhere that makes you miserable. Throughout the Web, you can see people’s passion by way of the things they do and write. Do you do anything different when your passion waivers? Please let us know in the comments.